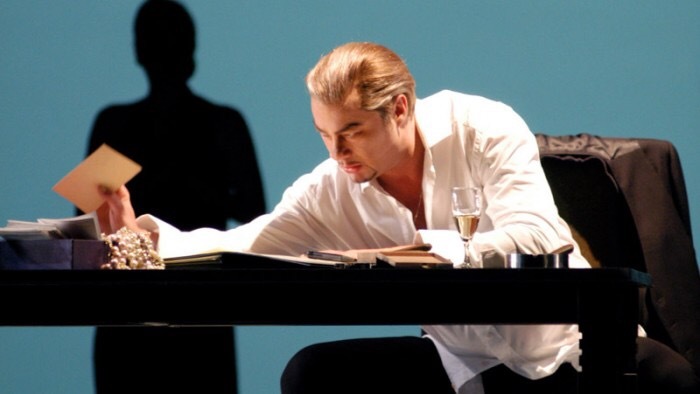 The decision to go for Don Carlo in Berlin came in conjunction with booked Andrea Chenier at Deutsche Oper Berlin, which initially had Aleksandrs Antonenko role debut scheduled, and return flight on Monday morning thus providing opportunity to see an extra performance on Sunday. I was intrigued by seeing René Pape and somehow did not investigate further detail about the production except that it has been premiered some time ago and this will be a revival for the season. The plot revolves around the eternal choice between private happiness and societal requirements and demands of the social standing, namely, what it means to be the king when decisions involve your family members, and how far your personal sacrifices go? Don Carlo in this particular production is like an off-hand teenager who requires certain means to be disciplined, while numerous internal challenges and conflicts in the family might ruin everything. Elisabeth is locked in this unwanted marriage without love and Eboli’s unrequited love creates a lot of pain to everyone. In overall, the main surprise was the directorial and staging approach used, as there were quite a lot of moments that supposedly were carrying symbolic or implied meaning in director’s mind but was difficult to decipher or accept. Firstly, the staging concept built around fixed prop – family dining table serving throughout all five acts and complementary panels moving around and opening and closing additional stage spaces is kind of minimalistic but at the same time efficient. My main question towards intent was a purposeful transfer of the libretto time into no-time, combining modern, domesticated royal dysfunctional family routines with intimate, close bond with Inquisition and church usurping the seat at the royal table at the finale. In this context many details are left unanswered, like obsessive ironing of the husband’s shirt done by the queen, Elisabeth; feeding chocolate cake forcefully to the maid; demonstrative placement of feet on the table (Carlos, misbehaving son) or compulsive wish to sit on it (all except Philipp); five naked, dirty, beaten up bodies thrown in front of the royal dining table and prepared for autodafe with elements of rough torture – some of the episodes were prompting the audience to giggle, and the latter, concluding part 1, made number of people to leave in disgust. Probably it was the intent of the director – to provoke and challenge? If so, the work has been just partially completed. The main protagonist of the opera, in fact, is king Philipp, as he is facing numerous moral, emotional and managerial challenges and René Pape is ideal interpreter of the role. His acting skills are painting the character with depth and details that provide insight much further than only vocal means could provide. It was unfortunate to hear from the staff after the intermission that maestro did not feel well and asks the audience’s understanding of a carefull approach in the second part. 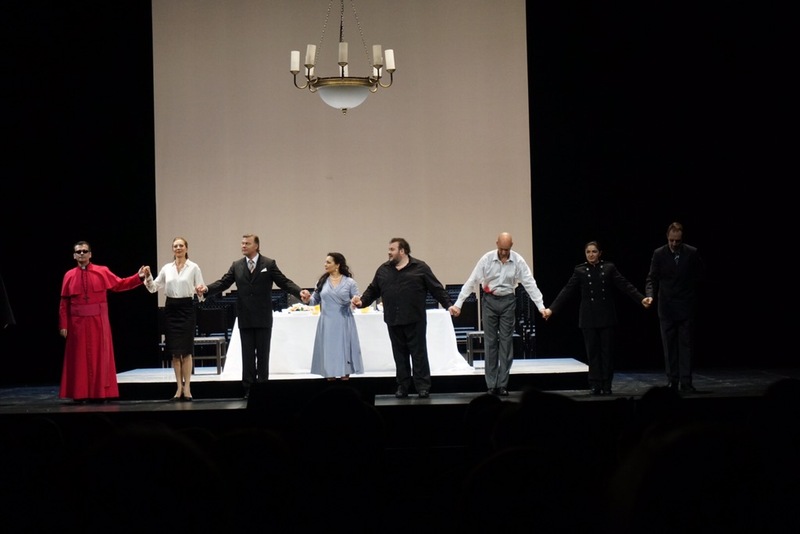 Even with such obstacle René Pape outperformed all other cast proving his professionalism and mastery of the role, especially in “Ella giammai m’amò”. Lianne Haroutounian as Elisabeth was a perfect match for role requirements, she delivered emotionally fulfilled, vocally colourful interpretation. Marina Poplavskaya portrayed mean and scheming Princess Eboli, unhappy in unrequited love. Her voice is a great fit for the role and her acting talent had the opportunity to flourish in current production despite all its limitations. Her “O don fatale” sent shivers and earned an enthusiastic reaction from the audience. Initially, I was disappointed in Roman Trekel as Rodrigo, but he became better towards the end of Act 2 and delivered a heartbreaking performance of “Io morrò, ma lieto in core” in Act 4. I had also mixed feelings towards the performance of Fabio Sartori, partially because of role credibility, but vocally he conquered all challenges required by the score. The directorial approach also positioned Sartori in an unfavorable position as the concept offered an interpretation of Carlo as cowardly and self centered, especially visible in the scene of Posa’s death when in response to Rodrigo begging to hold his hand, Carlos turns away and hides. In overall, this was an evening filled with mixed feelings – some disappointment, some confusion, some gratitude and pleasant surprise. Would I recommend you to go and see this production? Doubtful, probably would recommend some other interpretation of one of my beloved “Don Carlo” – probably, the production of Marco Arturo Marelli at Deutsche Oper Berlin, which impressed me a lot a few years ago. Opéra in five acts by Giuseppe Verdi to a libretto by François Joseph Méry and Camille du Locle after Friedrich von Schiller´s dramatic poem »Don Carlos, Infant von Spanien«. Next Post: “La Damnation de Faust” with Castronovo, Kožená, Boesch, Rattle at Staatsoper Berlin.